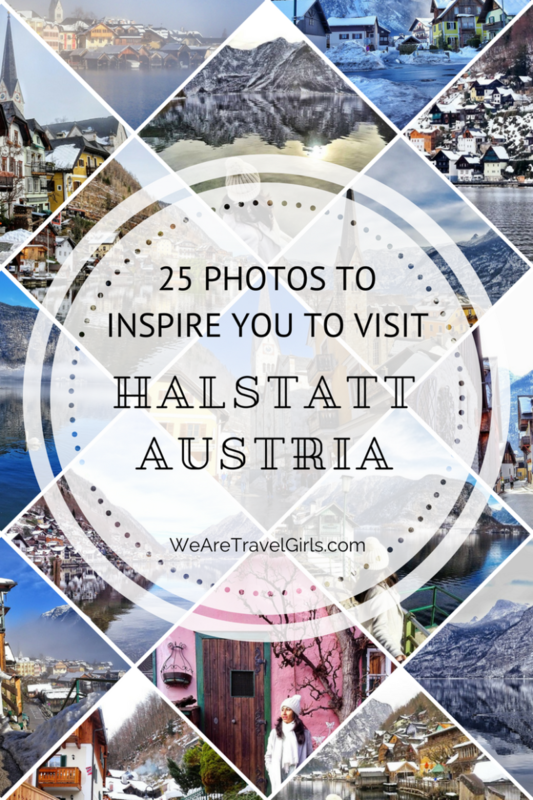 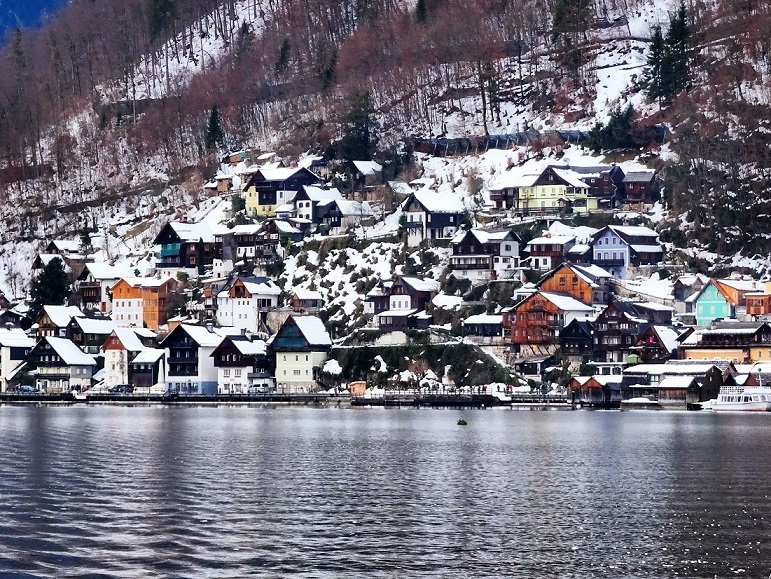 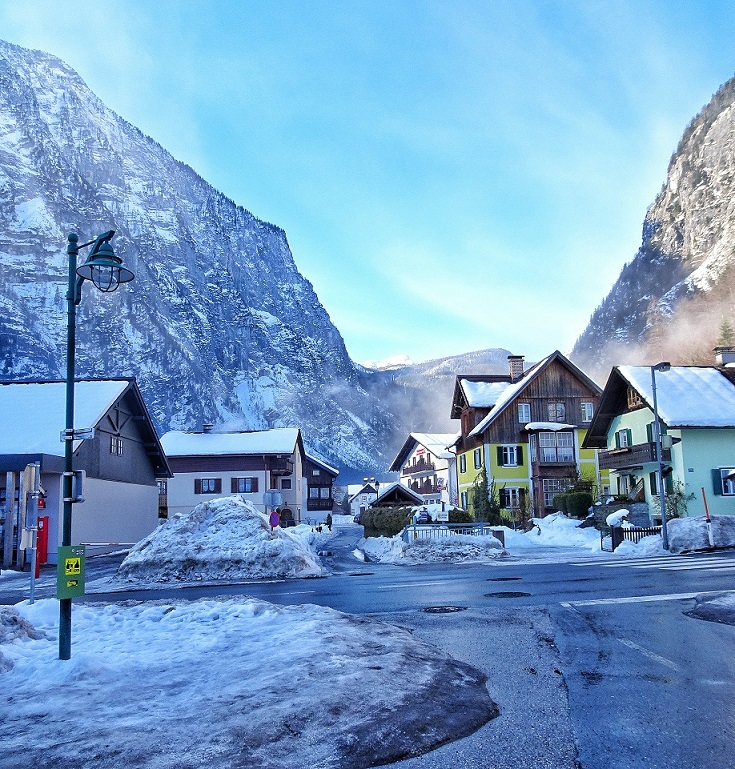 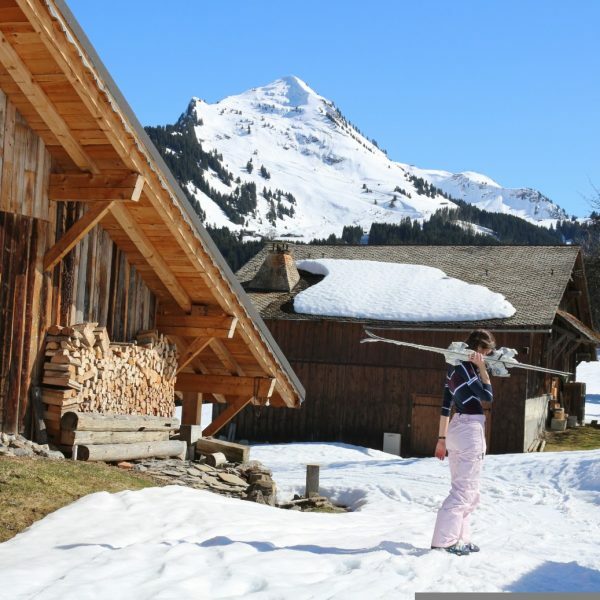 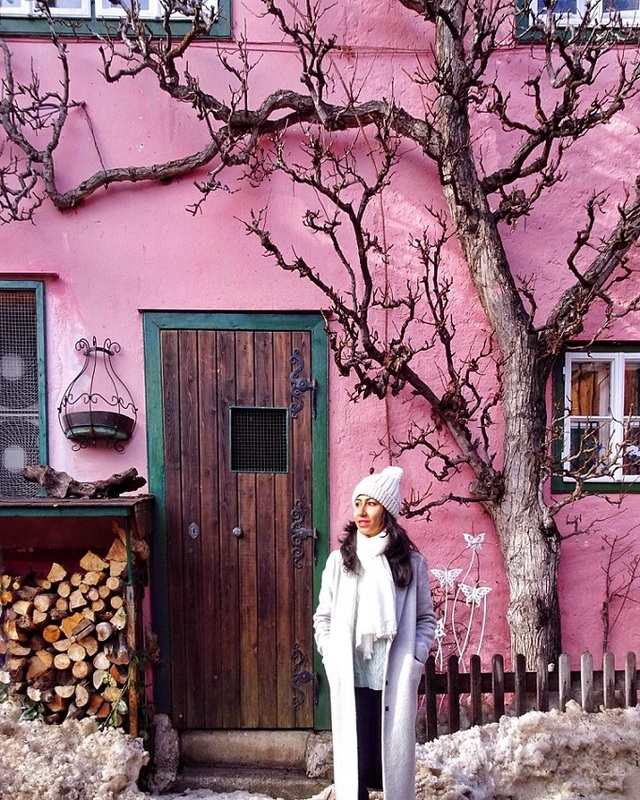 I was craving a winter wonderland experience this year, and having seen pictures of snow clad alpine houses in Hallstatt, on the eastern shore of lake Hallstättersee, I just knew at once where I should go! 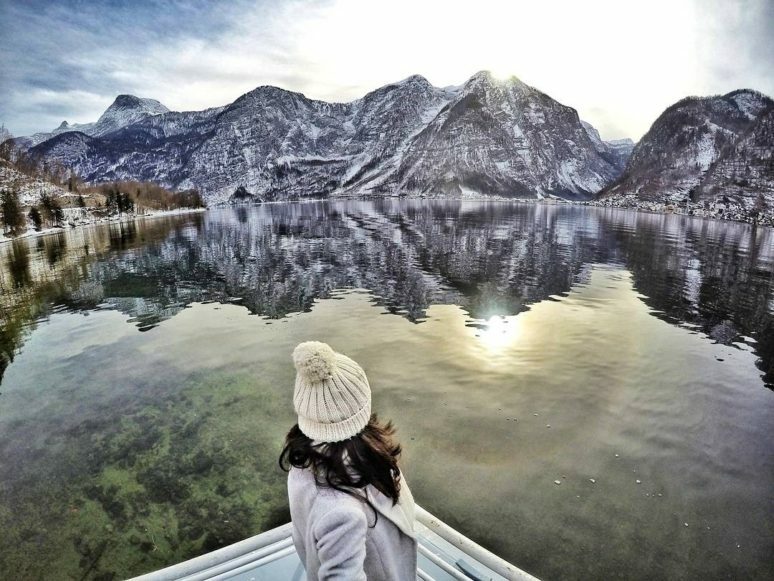 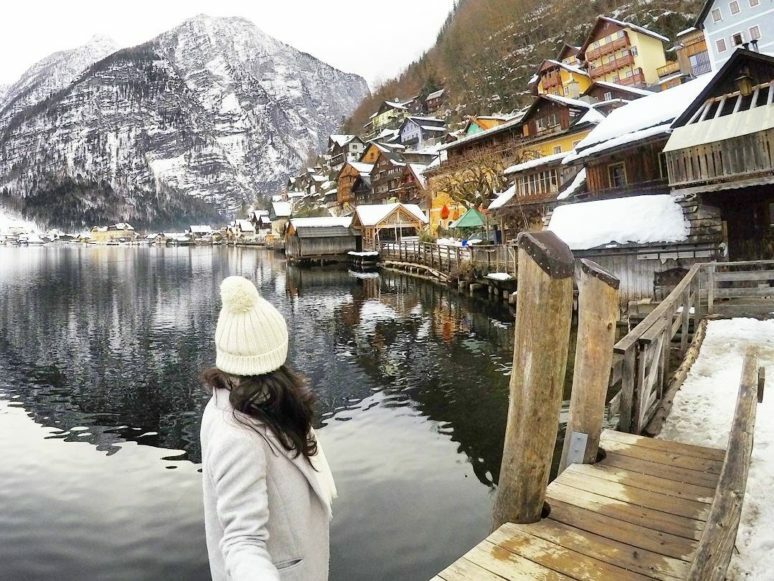 I visited Hallstatt 2 years ago during summer, but I couldn’t have imagined how gorgeous this place would be in winter! 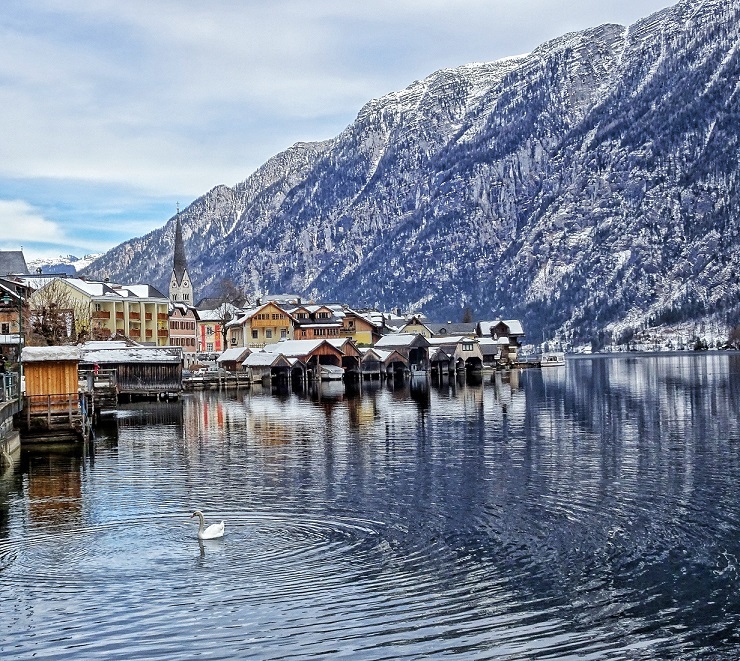 Considered to be one of the oldest inhabited settlements in Europe, Hallstatt is a UNESCO heritage site and an important Austrian tourist attraction. 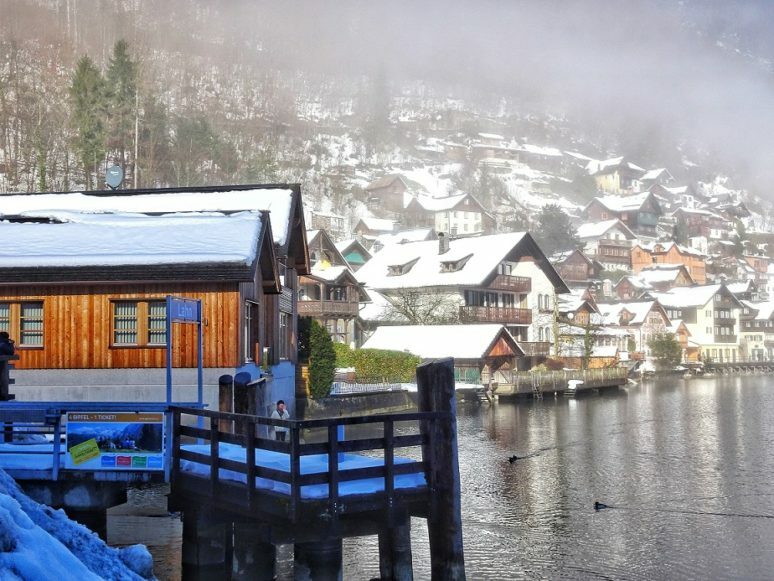 It’s a very tiny village spread across 23 square miles, and with a population of just 760! 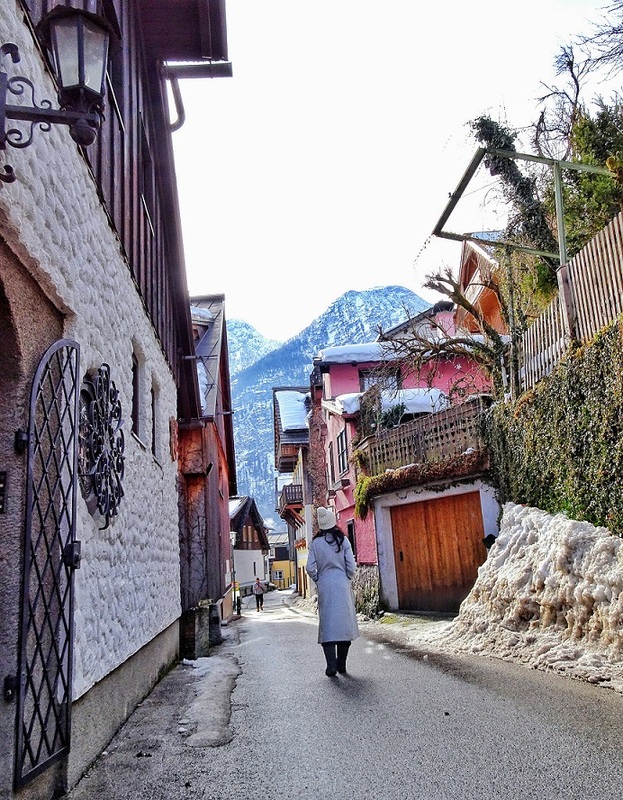 So you can literally walk back and forth through the village multiple times in just a couple of hours. 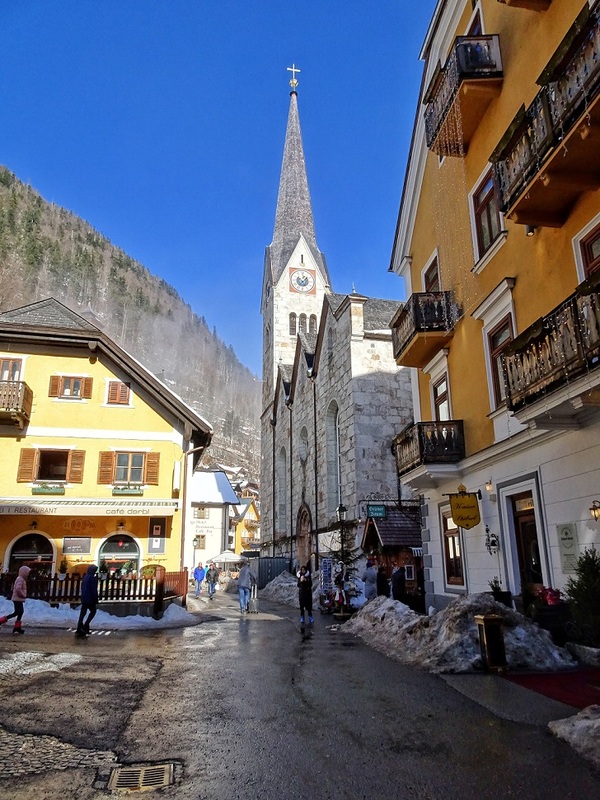 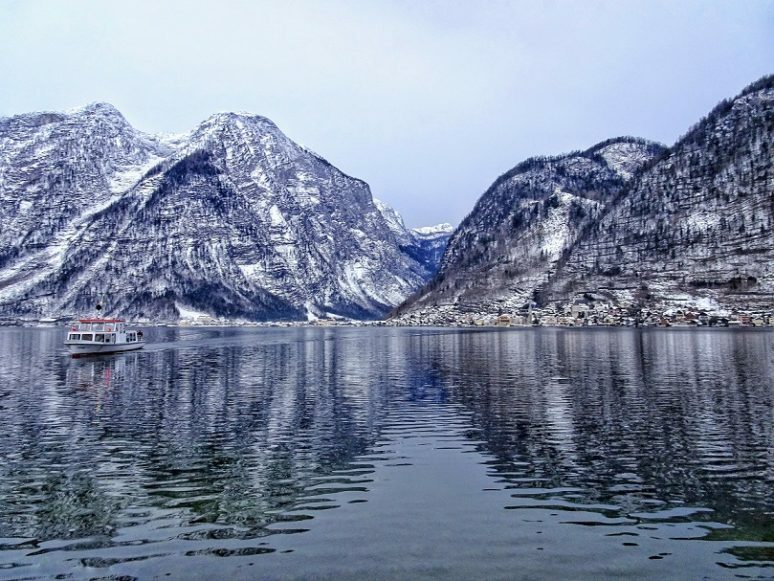 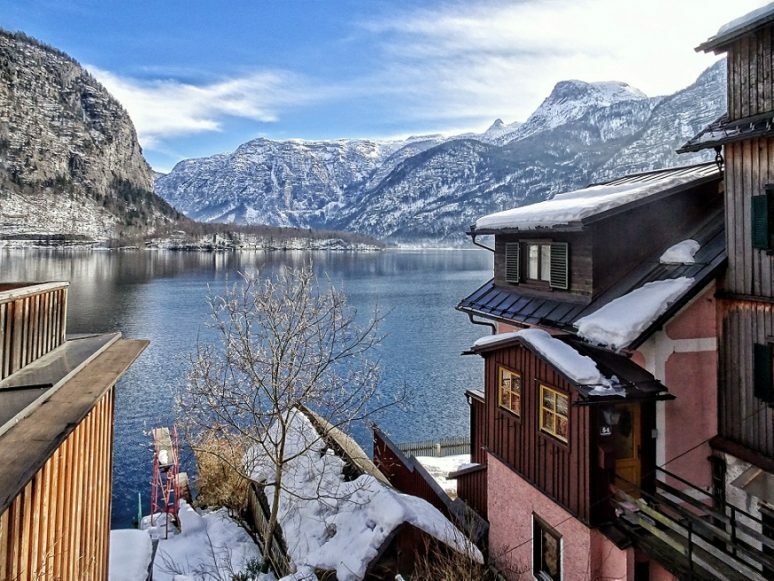 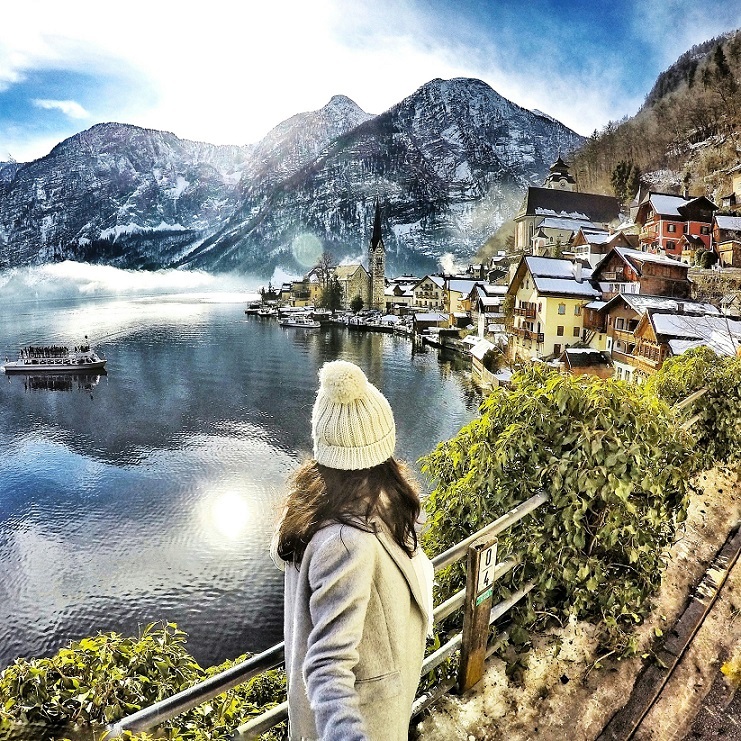 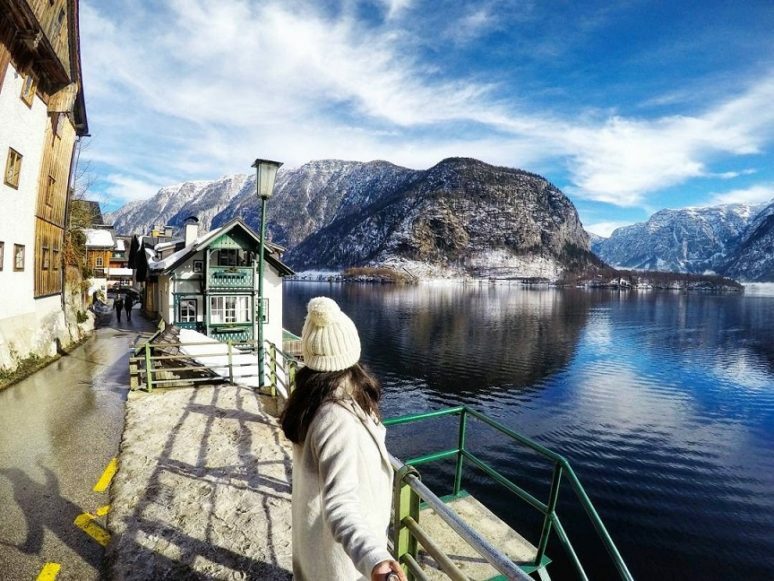 If you are getting there via public transport, then you have to take a 15 minutes ferry from Hallstatt train station to the Hallstatt village and the gorgeous views start right from the point where you take the ferry…. 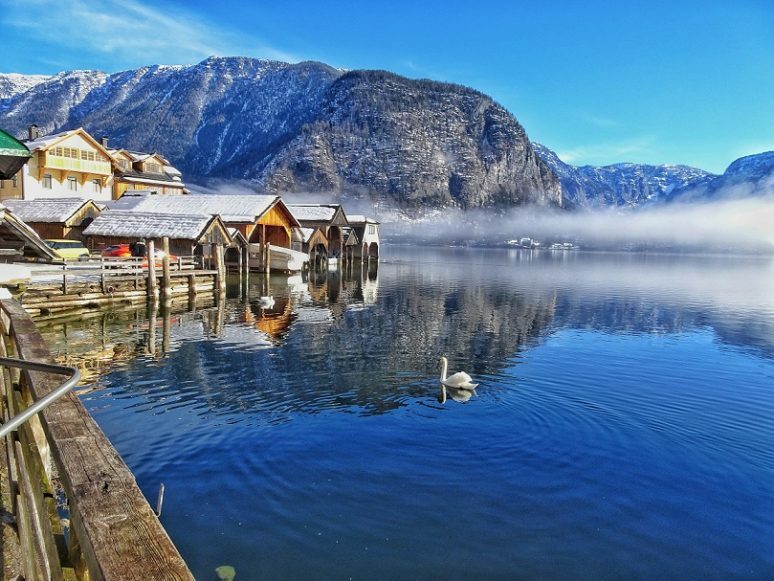 During my stay, I was blessed to wake up to a foggy morning, and as the fog lifted it gave way to some incredible dreamy shots. 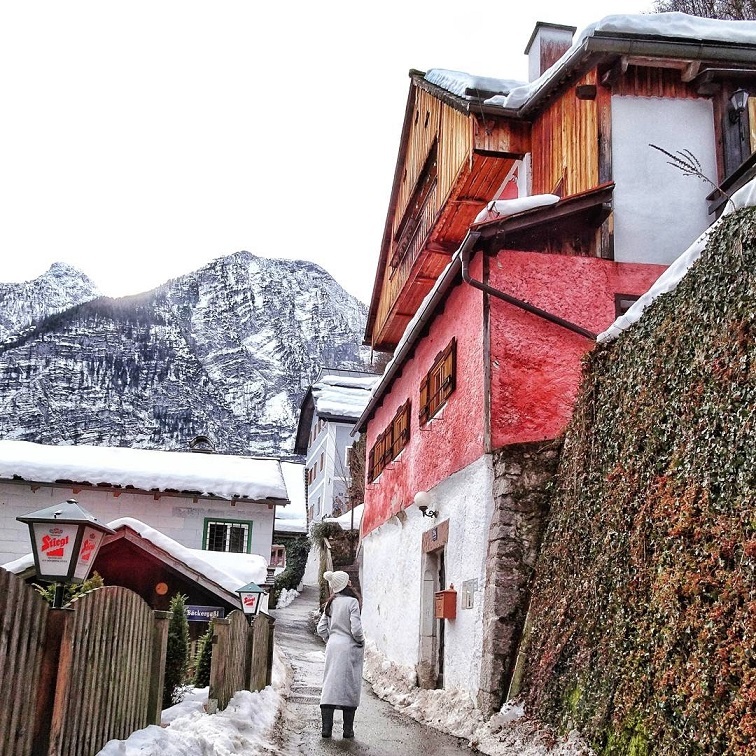 I took a leisurely walk around the village while most of the tourists were still sleeping, and took the several steps leading up to more terraced houses and views from an elevation. 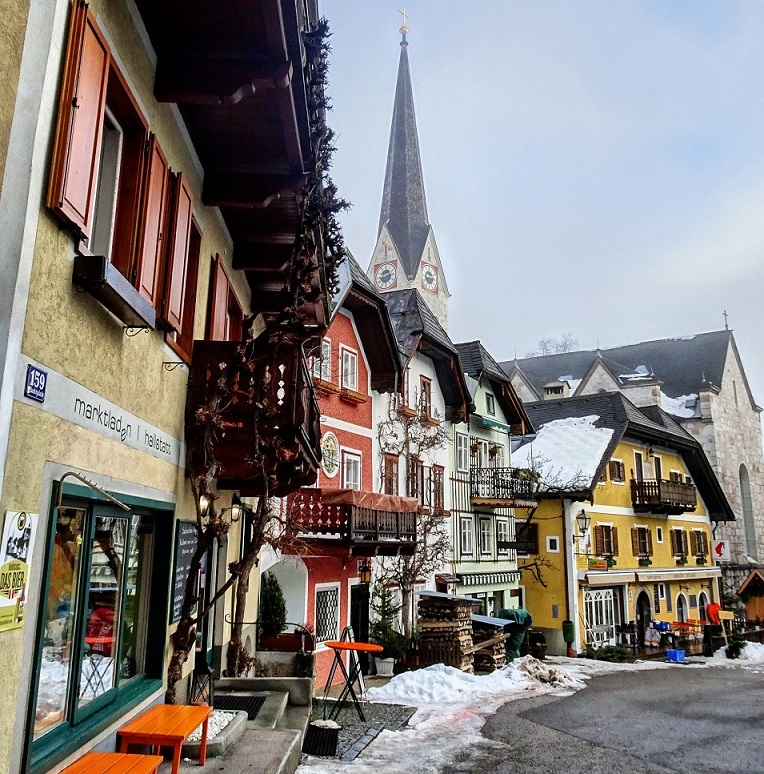 The historic market square with its towering Protestant Church is the most frequently photographed view of this picturesque village. 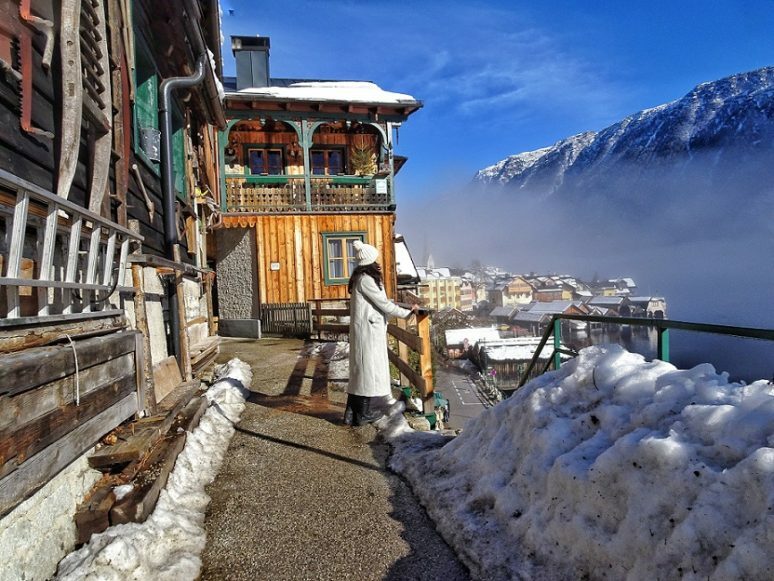 Eventually the sun came up and the fog cleared. 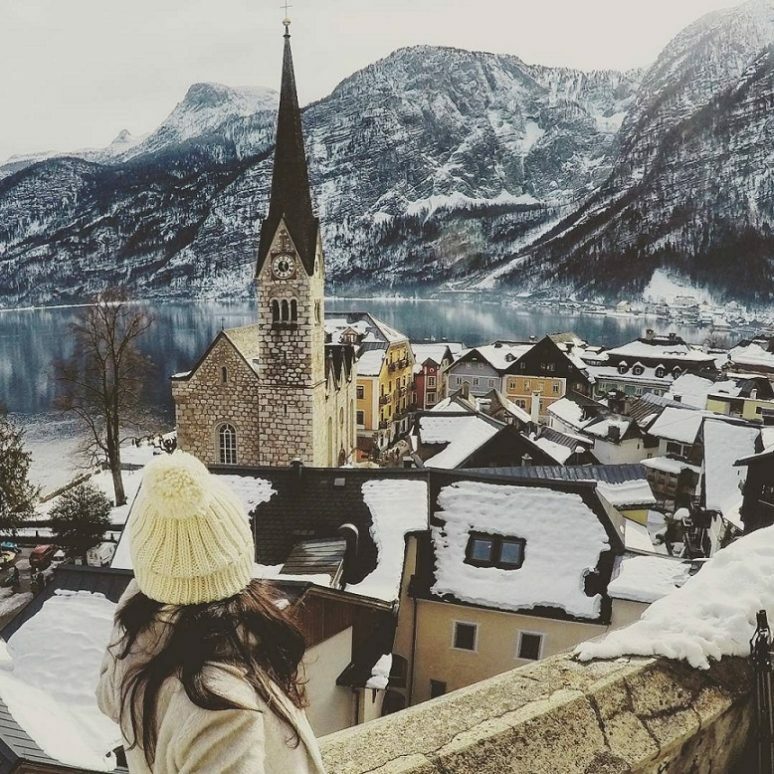 So, I climbed the steps leading to the top of the Gothic Michaels chapel (another church just a few steps up from the market square), and was rewarded with the most stunning views of the market square with the lake and mountains providing the fairytale backdrop. 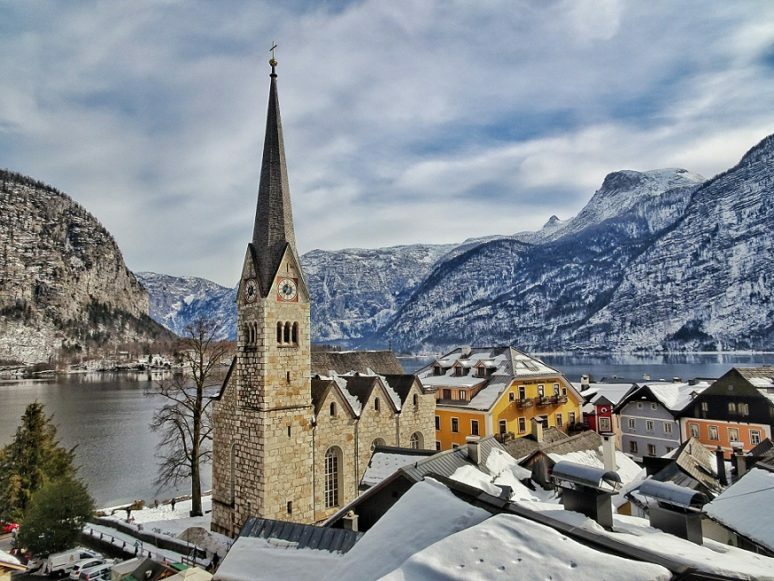 After the gothic church, I walked to the left of the market square (upwards, past the Protestant church) and within couple of minutes there is this most famous postcard view of Hallstatt. 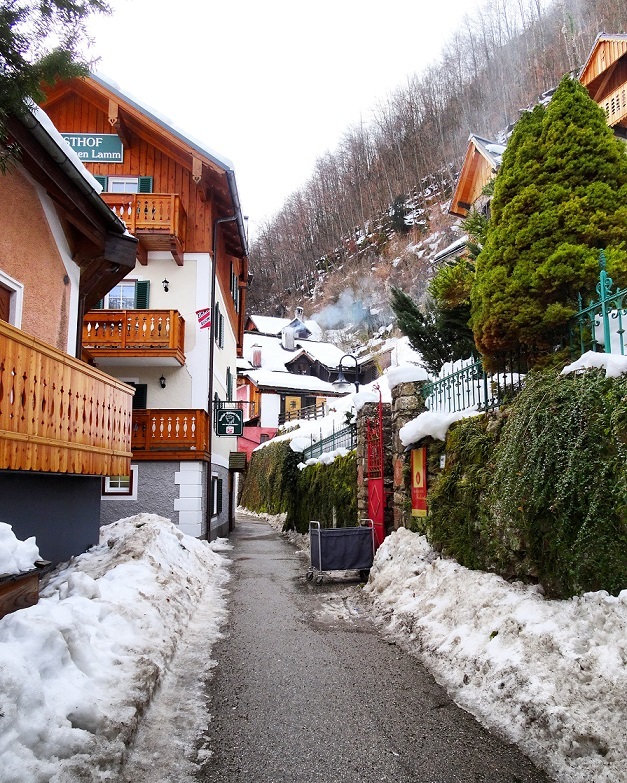 As I kept walking further up the street, I saw so many more cute alpine houses at the bank of the lake. 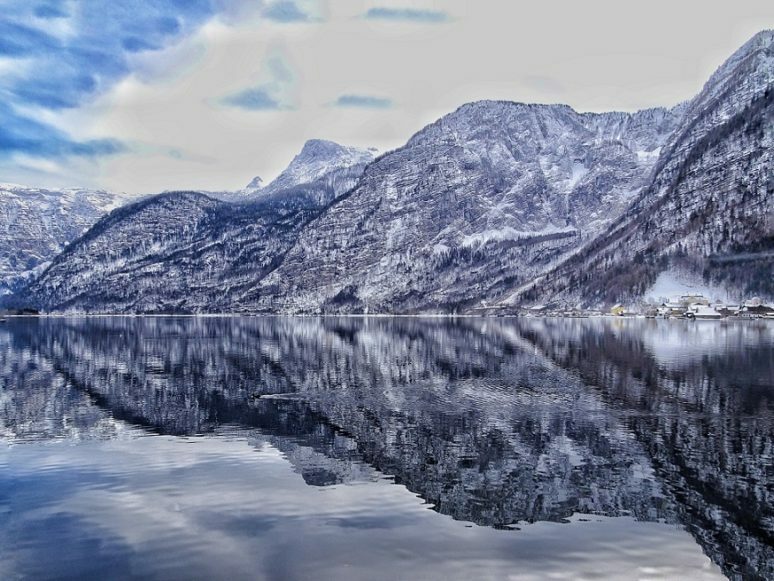 Since the fog had cleared, I went back to the other side of the market square where the lake provided mirror-like reflection of the village for as far as one’s eyes could see. 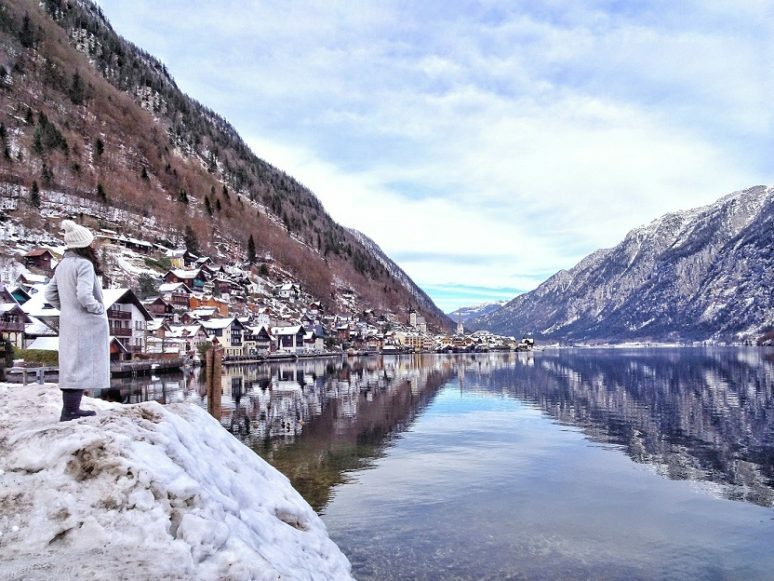 And finally it was time for me to say goodbye to this beautiful village, and take the ferry from the market square to the train station for my onward journey. 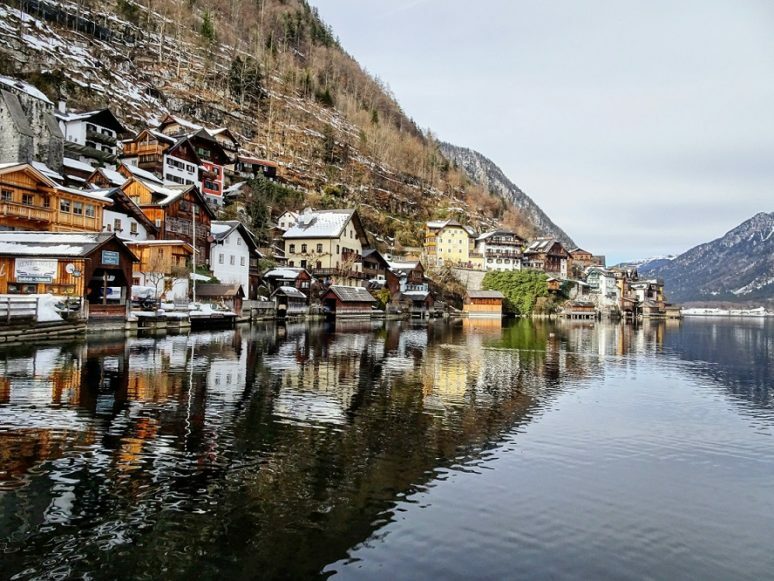 Halstatt is one of the most beautiful villages to spend a day or two exploring and I thoroughly recommend visiting in both summer and winter! 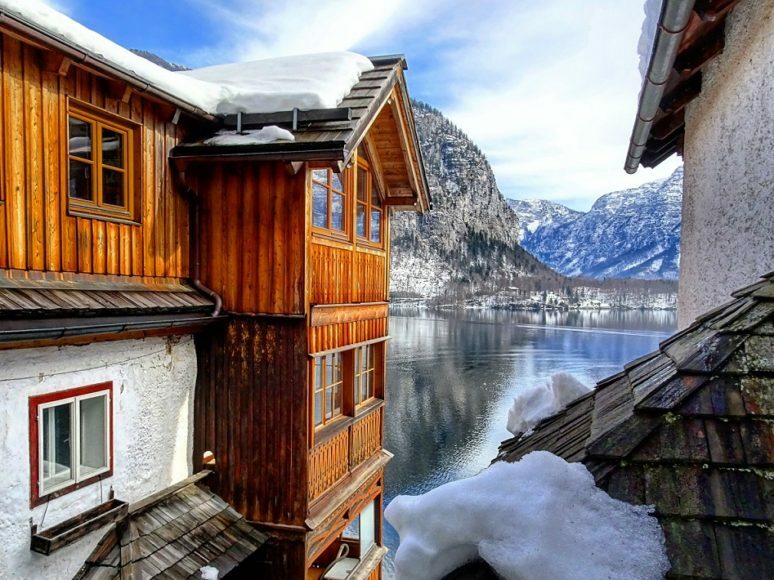 Offf !… looks like a fairytale… Awesome.